Are you a fan of TV's long-running soap, "All My Children"? The one with Erica Kane and all nine husbands? (She may be over nine by now. I admit I haven't watched in awhile.) One of her former husbands, the stalwart Jackson Montgomery, is played by Walt Willey, a native son of Illinois. And one of Erica's chief rivals over the years was Brooke English, played by the lovely and charming Julia Barr. 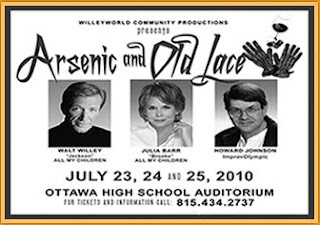 Willey is coming back to Ottawa, Illinois, and bringing Barr with him, as the two will perform in Joseph Kesselring's screwball classic "Arsenic and Old Lace" at the Ottawa High School auditorium. They'll be joined by Kim "Howard" Johnson, Willey's childhood friend, billed as a "noted Monty Python diarist and improvisational actor." The production is part of Ottawa's Riverfest with performances on Friday, July 23, Saturday, July 24 and Sunday, July 25, 2010 in the OHS Auditorium. Willey, Barr and Johnson will play three members of the crazy Brewster clan, with Willey as Mortimer, the only sort-of-normal one, Barr as his Aunt Abby (even though she's only two years older than he is in real life) and Johnson as Jonathan, the creepy one who looks like Boris Karloff. Ottawa actors will fill out the rest of the cast, including Mortimer's love interest, Elaine, and adorable Uncle Teddy, who thinks he's Teddy Roosevelt and the Panama Canal is in the basement. Riverfest's press materials note that "Arsenic and Old Lace" is WilleyWorld Community Productions’ second annual effort in developing a self-sustaining theater for the Ottawa community as well as a mentorship program for youths in the Ottawa area. For more information, visit the Riverfest link above. Or pick up a copy of "Arsenic and Old Lace" at your local bookstore and get a headstart on the plot before you go. It's a fun, crazy play, perfect for all audiences.